This taco filling is a redo from an unnecessarily long recipe. I’m much happier with it now and hope you’ll be able to navigate it quickly. 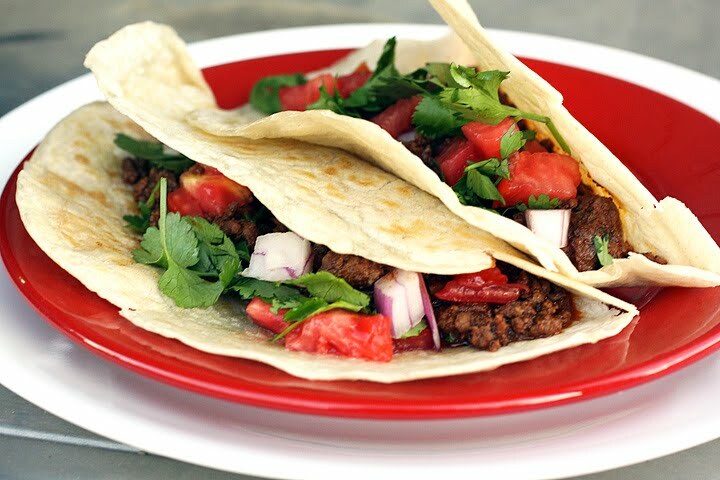 Skip the chemical laden taco spice packets. This re-worked recipe from an old magazine puts those things to shame. 1. Place all the spices together in a small bowl and set aside. 1. Heat oil in a large skillet over medium high heat. Add onion and cook, stirring occasionally, until softened, about 4 minutes. 2. Add garlic and spice mixture; cook, stirring constantly, until fragrant, about 1 minute. Add ground meat and cook, breaking meat up as you go. Deglaze the pan a little with extra broth if needed at this point. Scrape the pan bottom to prevent scorching, until meat is no longer pink, about 5 minutes. 3. Add tomato sauce, chicken broth and vinegar; bring to simmer. Stir frequently and break meat chunks up completely. Cook for about 10 minutes or so until the liquid is reduced and thickened, but mixture isn’t dry. Adjust seasonings with salt and pepper if needed. I will try this next time we do tacos. Cool Steph! This is the one I tend to use most and my favorite. Sounds great! I have a go to recipe, but always like trying variations! Thanks! Sounds amazing. I can't wait to try it. Really, yak? Did you just throw that in there to see if we were paying attention? Nope my friend. It's yummy and my favorite meat right now. It also makes for fun puns and double entendres. How did you know I had a packet of ground beef in my fridge and tacos on my mind? Thank you for sharing your creative culinary explorations...you inspire me, and I'm glad to know you. I hope you have a blessed day tomorrow. Much love and hugs from Austin! Yak.. hahaha It just sounds funny, don't think we have that here?? ZI was just talking to Dewey about what to do with leftover pork shoulder.. this will work!!! Thanks Laura!!! I need to send this to my mother. She still buys those MSG-laden packets and it gives me the chills. laura! please come cook for me at my house! these look delicious. you make me feel hungry!! I've never seen brown sugar added to taco seasoning before, interesting! We already had homemade tacos this week, looks like we'll have to do it again next week. This recipe sounds great! This looks and sounds great. I am going to have to try it. I love your blog and enjoyed checking out all the recipes. Your photos are beautiful. Have a great weekend, too. That looks delicious and you're right; those premade packages for taco's are terrible. With far too much salt and really not good in the taste department either. This looks so much better! I've been making my own taco spice mix for years but really love the addition of brown sugar you have in yours. I will definitely be trying your version the next time we are having tacos. Thanks for sharing!